Welcome to Sourcing Your Heart's Gift! The purpose of this course is to help you to dive deep into your heart to remember or discover your heart's purpose and learn how to courageously share that gift with the world. The information in each module will build on the previous one. You'll receive access to a new module each week. Please feel free to go at your own pace. Perform the Daily Optimization Practice every day, first thing. Listen to the Yoga Nidra practices as often as possible, ideally 3-7 times a week. Listen or watch the teaching on the weeks theme at least once. Do the journaling exercise at least once. Supportive Materials are totally optional but give a richer depth to the teaching. There's a lot of information to this course. This is a rich 6 weeks of doing the work to evolve to your next level of consciousness, one that will make a big difference to you and to the world. If possible, carve out time every week to do the course materials. Don't feel bad if you don't get to all the material every week. That's the advantage of having it all on line and having lifetime access to the material. You can go at your pace and review the material as often as you wish. You'll receive an email every Monday to remind you that the course materials are up for the next module. You may access the materials either through that email, or go directly to Scottmooreyoga.com/classes and events/SYHG Main. Find the link at the top of this page to connect to the live Yoga Nidra, Q&A and discussion session for the following Sunday at 11 am Eastern (this week will be February, 18). Each Sunday morning, click on the link at the top of this module that links you to Zoom, our virtual meeting platform, to join our live Yoga Nidra session. Plan on connecting about 15 minutes before the session to download Zoom, if you need to, and get the technical details set up. Zoom is a simple program but you may need to orient yourself to a few details like testing your microphone and camera which you can do easily from the setting in Zoom. You're going to want to use a device like a laptop, desktop, iPad or smart phone that has a camera and a built-in microphone. Also, set up your Yoga Nidra space in advance. Try to plan to have space and time where you will be uninterrupted for 75 minutes. I'll record these sessions and post them to each module so you can review it later if you missed it or want to watch it again. If you'd like to understand the philosophical instruction part of the module before you do the weekly recorded Yoga Nidra practice, then listen to, watch, or read the Instruction for this week's theme first. It will either come in written, video, or audio (or some combination of the three) however, it's important to keep in mind that that this course is not meant to be an intellectual exercise. We are using a deeper wisdom, the divine wisdom of our heart, to do this work. Whether before or after you do the Yoga Nidra practice, at some time during the week read through or listen to the instruction about the theme for the week. This sadhana, or specialized daily practice, will prime you to greet your day as your highest, most evolved self. By doing it daily, you make small, incremental steps which will have an enormous outcome for the development of your heart. Do this practice every day. It's designed to take about 15 minutes to accomplish. Basic constitution (get a drink, bathroom, coffee if you need it). Daily Meditation (below and on the main page). Repeat the positive statement of truth from the Daily Meditation or (create your own). This journaling exercise is designed to help you to hear and encourage the voice of your heart. It's modeled after Nan Seymour's inimitable writing practice called River Writing. The invitation is to find a notebook of paper, nothing special, and a free-flowing pen. Set a timer for 11 minutes, and write non-stop with a prompt as inspiration. Write whatever comes to mind. It could be an idea about the prompt, a word or symbol about the prompt that spoke you to. It doesn't matter. Simply keep your pen moving. You're not writing to be published. You're not writing to be famous. There are no edits. Don't worry about spelling. Just write. If you get stuck, here are two good suggestions to help keep your pen moving. The first is to write, "What I really want to say is . . . " and see if that kickstarts your pen again. Another idea is simply writing, "I don't know what to write, I don't know what to write . . ." and after a few times, usually you'll begin again writing with a flow. This writing is just for you. You do not need to share it. However, if you do choose to share your writing with someone, give them the instructions that they are neither to critique nor encourage your writing. Only a simple, "Thank you" is required. Nothing more or less. Remember, the prompt is just there as a little push to get the pen flowing. The prompt I invite you to write on is from Mary Oliver's poem, Wild Geese. This week, ask three different people what they feel your greatest strengths are. You can do this in person (preferred) or by phone or email. Notice your own reaction to how other people recognize your strengths. 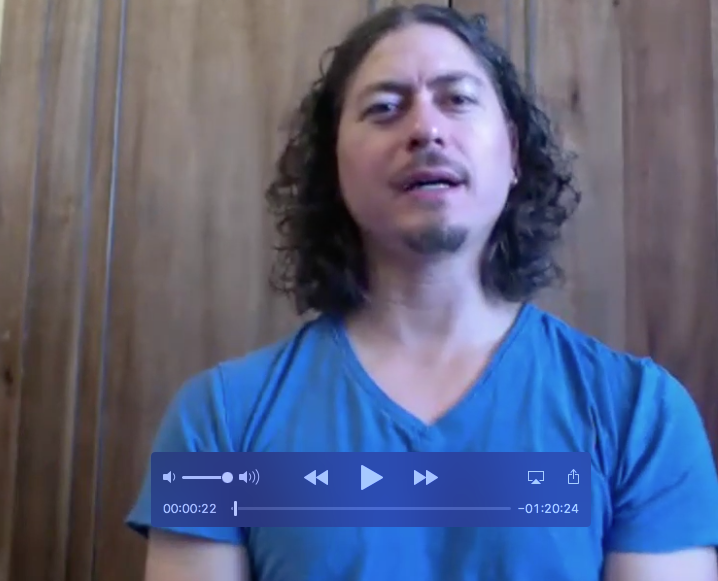 In this session is a description of how Zoom works, a breathing practice to connect us with the world and the world with us, a 25-30 minute Yoga Nidra practice, discussion, and Q&A. Here's an incredible article that speaks much of the same kind of language as this course by Benjamin Hardy from Medium. Adyashanti, author of The Way of Liberation, Falling into Grace, True Meditation, and The End of Your World, is an American-born spiritual teacher devoted to serving the awakening of all beings. His teachings are an open invitation to stop, inquire, and recognize what is true and liberating at the core of all existence. Based in California, Adyashanti lives with his wife, Mukti, Associate Teacher of Open Gate Sangha. He teaches throughout North America and Europe, offering satsangs, weekend intensives, silent retreats, and a live internet radio broadcast.